Fake college degrees are a relatively new business. Before the Internet started reaching every home, in the mid-80s, it was almost impossible for phony colleges to reach potential customers. The need for degrees, continuing education and career advancement, however, has always been there, and fake college degrees proved to be the perfect way to give people a feeling of achievement without much time or money invested. If you know where to look and are willing to shield enough cash for it, you can buy basically any type of fake college degree you want — From Associate’s to Bachelor’s to Master’s, and in almost any subject ranging from business and human services to art, design and technology. The only degrees you won’t find offered online are medical or law degrees, as that would mean the company offering them is breaking the law. Anything else is fair game. Diploma mills prey on innocent people looking for a way to better themselves. They usually have slick Web sites that offer testimonies (like how well somebody is doing after graduation or how great the teachers are), list career information and work hard to give the illusion of being a real, substantial school. Some offer degrees based on “life experience.” While many real colleges do give credits to those with substantial background on a specific area or topic, no serious school will award a degree without requiring some type of coursework, research paper or other form of student participation. Other forms of diploma mill degrees do require some form of work, but courses are short (often just a few months) and students are either given just practice exams or are told to study on their own without requiring a final test. Degrees of this type often come with extras, such as transcripts, certificates, letter from the Dean and several other forms. The more papers are in the kit, the more it will cost you. On the average, though, phony degrees start at $200 and can cost up to a few thousands. Because there are no detailed laws covering the use and production of fake degrees, companies can get away with selling them online and claiming that “this is a common legal loophole.” While it may not be a crime to make them or buy them, it does become illegal to use them to dupe an employer into believing you have a real degree in order to advance your career. Even if you’re not aware the degree is fake, you can still get in serious trouble and lose your job if you don’t act responsibly. Novelty and replica degrees are different in the fact that they don’t hide their purpose. Companies selling them don’t claim to be real schools and they go as far as noting on their sites that they are meant to be used as novelty only. These details, however, may only be noted in small print or worded in a way that people still think the degrees can be legally used. In most cases, though, people visiting novelty and replica degree sites are looking for something to pad their resumes or hang on the wall, and most are aware that what they’re buying has no real value. They are either intent on fooling an employer or using the degrees to boast their “credentials” in front of friends, family and colleagues. Some fake colleges will take your money and run, while others are unaccredited learning programs that can put you into legal trouble if you present their degree as real and it’s later found out that it’s not. Even if everything seems in order, you might still find out that credits are worthless once you try to transfer them to an accredited university. So before you provide your credit card number and contact information to an online college, there are some red flags you should be in the lookout for. 1. 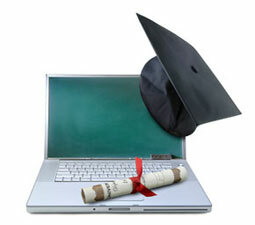 The degree can be obtained in a matter of days or weeks and without taking any classes. No real college will grant you a degree based only on life or work experience. Some universities may recognize past experience or credits, but this is always a partial step and you will always need to complete classes or pass exams in order to finish the program and obtain a degree. 2. You can’t find information about the study program itself. Fake colleges spend page after page talking about their degrees and why they’re important, as well as providing tons of links to their payment area. A legitimate school, on the other hand, will go in detail about the coursework, topics you will be studying, books and papers, etc. 3. There’s no contact information besides the ordering number. Even schools that operate 100 percent online will still have a phone number and postal address for students to use if needed. If the only number you see is a 1-800 number used to place orders, wonder why the secrecy. 4. There are more complaints than success stories about them. Let’s face it -Not everybody will love the school they go to, so complaints about unresponsive teachers, expensive late fees or unfair marks can usually be found about every online college if you Google their name. However, if all you can find about a specific school is how people feel scammed, how they haven’t received anything for their money or how the coursework is a joke, then stop, listen and then make an educated decision. In the end, always keep the old adagio in mind: If it sounds too good to be true, it probably is. Otherwise, nobody would be spending a fortune going to Harvard or Brown Universities.